Type a quantity next to your choice(s), then add to cart! Recommended for Pieces with a King base-diameter less than 1.5"
Recommended for Pieces with a King base-diameter between 1.5" and 1.75"
Recommended for Pieces with a King base-diameter between 1.875" and 2.0"
Recommended for Pieces with a King base-diameter between 2.0" and 2.125"
Recommended for Pieces with a King base-diameter greater than 2.125"
The board is a House of Staunton Striped Ebony / Bird's Eye Maple wooden Chessboard. 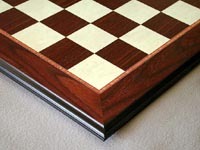 The board is 13mm thick and features a satin finish, with a molded edge.